In 1990, the song "Ice Ice Baby" introduced the world to a brash, white rapper named Vanilla Ice. The song, featuring the familiar beat of the Queen & David Bowie song "Under Pressure," swept the nation. Released in July 1990, "Ice Ice Baby" hit number one on the Billboard Hot 100 chart for the week of November 3, 1990, becoming the first rap song to hit the top of the Hot 100. As we were introduced to Vanilla Ice, we learned the dramatic life story of the white rapper from Miami who “grew up in the ghetto,” around ''gangs and stuff,” and the song "Ice Ice Baby" is filled with Miami imagery. (..."Miami's on the scene just in case you didn't know it / My town, that created all the bass sound"...) Imagine my surprise when I learned that the music video was filmed in Dallas, Texas. Much of the video was filmed inside an anonymous warehouse, but several scenes showing a crowd partying at a street corner are interspersed throughout the video, with Vanilla Ice rolling by "in his 5.0" and later dancing with the partiers. Exclusive: The crowd scenes were filmed at the building at 2800 Main Street, Dallas, TX 75226, along Crowdus Street. Currently, this is the site of the Curtain Club. 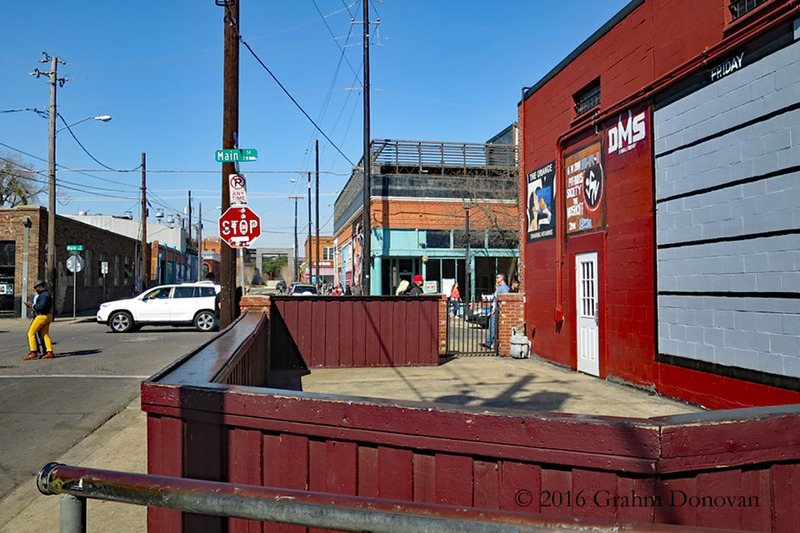 Reference: I determined this location after I learned that Vanilla Ice had been a valet at a nightclub in the Deep Ellum neighborhood of Dallas. I haven't seen this location listed anywhere online. This is one filming location that surprised me by the lack of commemoration, either online or on the site. The video was made for only about $8,000, but, for better or worse, "Ice Ice Baby" marks a seminal point in hip-hop. As I stood at the location, I was thrilled, but surprised that no one else seemed aware of the site's history. Rooftop scene the video for Vanilla Ice's "Ice Ice Baby"
The bulk of the "Ice Ice Baby" video was filmed inside a dark warehouse at night, but several shots show the skyline of Dallas in the background. Unfortunately, I haven’t figured out where this scene was filmed. If you know, please contact me. Vanilla Ice had been portrayed as a streetwise Miamian, who somehow also had the time and resources to be a champion motocross racer, until a terrible crash took its toll. You can listen to the Casey's Top 40 episode from November 10, 1990, which announces "Ice Ice Baby" as the number one song in the land, and Casey Kasem also delivers some of the Ice's purported backstory. Just over a week later, on November 18, 1990, an article in the Dallas Morning News revealed that much of the Vanilla Ice life story that had been peddled in the press was embellished at best. And, just like that, the media that had built him up began to tear him down. The enigmatic rapper, whose name had once been "a closely guarded secret," had mostly been raised in a Dallas suburb, with the almost comically unhip name, Robert Van Winkle. This led to "exposés" in such places as People magazine, and the New York Times, which had a glowing article in October 1990, was back in February 1991 trying to explain "Why the World Is After Vanilla Ice." When the Vanilla Ice movie Cool as Ice was released in October 18, 1991, it was a box office flop. But, no matter how Vanilla Ice's fortunes have risen and fallen, "Ice Ice Baby" will remain, ironically or not, a party favorite. When that familiar beat starts up, we'll all continue to "stop, collaborate and listen."